Overlooking the bay of Petit-Havre, our hotel presents a magnificent panorama view to Basse-Terre and the other islands of Guadeloupe. In this enchanting settings, you'll find the friendly athmosphere of our house. A real getaway destination, our charm hotel, entirely renovated in 2010, is situated between the renown seaside resorts of Gosier and Sainte-Anne, in a residential area at 200m (650ft) from the beach. You'll be accommodated in one of our 12 comfortable rooms set on three flats. 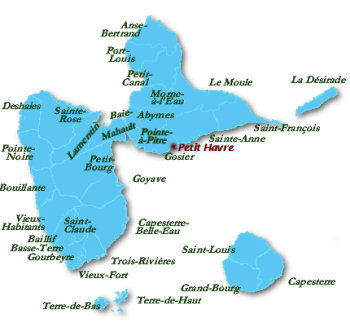 The Petit Havre Hôtel is at a distance of 20km (12 miles) from the Pôle Caraïbes airport, 16km (10 miles) from Pointe à Pitre, 10km (6 miles) from the center of Gosier and 5km (3 miles) from Sainte Anne. At the airport take the National Route 4, direction Gosier, avoid the center of Gosier and continue towards Ste Anne, Grande Ravine, roundabout lycée hôtelier (hotel school), roundabout St Félix, Mare Gaillard, after 3km (1.8 miles) take the 2nd exit to your right (panel Petit Havre) - the hotel is at 600m (1970ft).